From the base camp, we headed straight for the wooden platform and rigging as the next location we were going to was way off to the North. It seemed to be the most logical route to take, but we had to be careful not to run into any guards that might be patrolling nearby. We still hadn't encountered the guard team that were apparently looking for our camp, but then again that wasn't a bad thing. However, with COLUS mentioning the HoN Co. base storing some sort of high-tech armour area, it was entirely possibly that they had involved the Elite. If they were looking for us, we wouldn't even know about it until it was too late! Worse still, they could monitor our activity and then send the guards in to attack us when we seemed most vulnerable. We were careful not to draw attention to ourselves, sticking to the shadows off from the main road where the guard patrols may be heading along. Once we passed it, we were able to follow the curve of the main wall, continuing on North. "The next location is just a little further North of the first structure we found, but I wasn't able to make it out when we headed towards that network of bridges... I'm beginning to wonder if the scale is still wrong, or if it's hidden by stone or something..."
"Well we'll find out soon enough, although are we likely to reach the actual structure before the day is out?" "At a push we should be able to, but I've been looking at the map and I've been wondering if we're going to have to take a rather large detour..."
"Why? Is there something in the way? Is the path blocked?" "That's one way of putting it... Another way is to assume there isn't a path to block... From what I can make out, the next structure is set way above the same lake of lava..."
"And there's no direct path up to it...?" "Exactly... We can make it onto the structure from a small path that leads around, from what I can gather, but it means taking a huge detour around the lava lake, up to the North and then backtracking South back to the structure..."
We had been walking for a few hours now; we had reached the edge of the massive lava lake that the two structures were meant to be suspended way above, but we had yet to encounter either. Although THEROS said that judging from the distance we were from them, it was unlikely we would see them from where we were. We had decided to rest for some time, in a secluded place that was only exposed to the lava lake from one direction; it gave us protection from any wandering guards or strange creatures, and gave us a startling view of the alien beauty of the Nether which we rarely had time to appreciate. We took the risky option of attempting to cook some meat on one of the fires that was already ablaze on the Nether stone. We had decided it was worth it because we couldn't risk leaving a possible trail for someone or something to follow, so the less we used the less we left behind. "Fire is fire... I don't see how it can hurt us in any other way that normal fire can't." We settled down for the break, looking out across the massive expanse of bubbling lava; it was oddly serene despite the chaos of the heat and intensity around us, with the dark Nether stone contrasting starkly against the brilliant light that was released. We ate in silence, just appreciating the view. When we were finished, we packed everything that remained away and set off towards the North again. We still had some distance to go, but we shouldn't be too far away from it now. "Yeah, looking at the the terrain around us, I don't see how we can make it over to the structure any other way than already stated..."
We decided to remain nearer to the edge of the lava lake rather than follow the wall along. That way if there was a different way across, we were more likely to spot it rather than having to go all the way around. Then again, judging from the mass expanse of bubbling orange and red before us, I didn't see how that was going to be possible. But it wasn't long before we spotted something that made us realise how far we really had to travel. 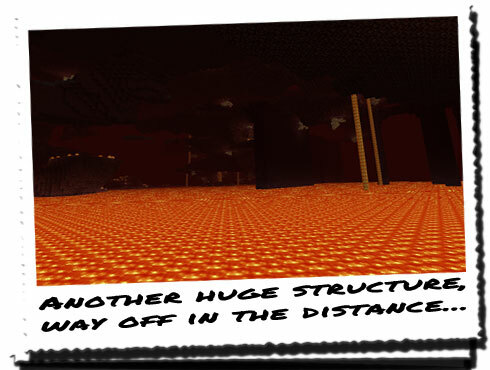 Up ahead over the lava lake loomed a massively large structure; much like the other one, it seemed to be constructed of the same strange Nether stone bricks, and large pillars rose out of the lava, climbing way up to form the basis for the bridges. "That's where we need to go, and this is where we are now... We need to track this structure all the way along this Northern section here to get to it..."
THEROS traced the route over the map, indicating where we were most likely going to be able to gain access to the structure. Putting it away afterwards, we continued on hoping to make it there before we needed to stop again.